Darby Creek is located within southeastern Pennsylvania and flows into the Delaware River, south of the Schuylkill River and the City of Philadelphia (Figure 1-1). The Watershed straddles the Fall Line, the imaginary physiographic line separating the Coastal Plain, vividly exemplified by the John Heinz NationalWildlife Refuge at Tinicum, from the rolling hills of the Piedmont. 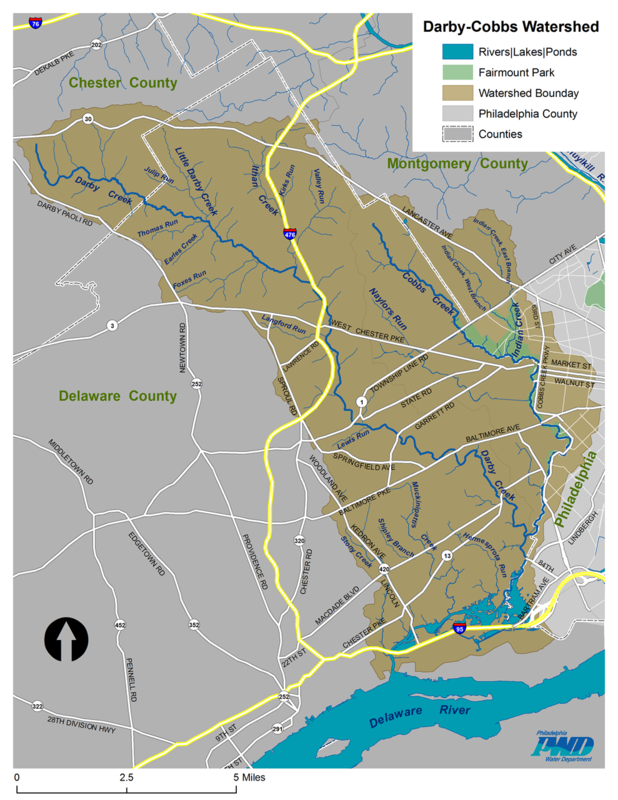 The Darby Creek Watershed includes more than 77 square miles and includes portions of Chester, Delaware, Montgomery,and Philadelphia Counties, with all or parts of 31 municipalities. Most of the Watershed is located within Delaware County. Major tributaries of the Darby Creek include Cobbs Creek, Naylors Run, Indian Creek, Langford Run, Little Darby Creek, Julip Run, Ithan Creek, Meadowbrook Run, Wigwam Run, Foxes Run, Muckinipattis Creek, Hermesprota Run, StonyCreek, and Whetstone Run, all of which combine to flow into the tidal Darby at the John Heinz National Wildlife Refuge at the Darby’s juncture with the Delaware River, south of Little Tinicum Island. The Refuge is the largest remaining freshwater tidal wetland in Pennsylvania.Tidal influence exists throughout this lower portion of the Darby and its tributaries, extending varying distances upstream on tributaries like the Muckinipattis, Stony, and Hermesprota Creeks,and also to old impoundment areas such as on the main Darby stem and Cobbs Creek. Although an exact count has not yet been done, the Watershed, though not large by watershed standards, is home to a population that approaches 500,000 people, for an average density of nearly 10 persons per acre.